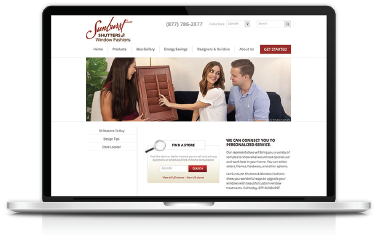 When the Zee Designs team developed the first Sunburst Shutters website, we also developed a robust Find a Store Search Feature. We were very proud of the many features it contained to help customers, store administrators, and corporate management. One of the key goals with the new Store Locator web app was to push conversions from the corporate site through to the local stores and be able to follow up on the results. Zee Designs put together a comprehensive design and development plan so that each store had its own identity. In addition, ZDI was hired to consult and work together with another company that has a software solution that specializes in SEO-focused, location-specific content for a few select store-specific websites. The two teams worked together to define important factors between the ZDI’s Designer Platform and their software solution so that the two delivered congruent content. ZDI worked closely with the client and other developers to ensure the corporate brand and important web-savvy guidelines were uncompromised. And it was so! The new Store Locator Web App offers meaningful, content-rich pages for each store location to serve as inspiration to potential customers and as exposure for stores; all optimized for SEO. A customizable page for every store, named in an SEO-friendly way. Each location can have a different style, content, text, images, coupons, interactive map, and more. Use of GPS in searching. Live map of all locations, updated on the fly if locations are added or deleted. It doesn’t need manual updating. Enhanced metadata features and fields specific to each store. Management of consultation requests by store with Corporate always in the loop. Default primary picture that can “replaced” by updating a store-specific record with their own, unique photo. Mission accomplished in a sleek, efficient, and beautiful way.